Yeti is a platform meant to organize observables, indicators of compromise, TTPs, and knowledge on threats in a single, unified repository. Yeti will also automatically enrich observables (e.g. resolve domains, geolocate IPs) so that you don’t have to. Yeti provides an interface for humans (shiny Bootstrap-based UI) and one for machines (web API) so that your other tools can talk nicely to it. Yeti was born out of frustration of having to answer the question “where have I seen this artifact before?” or Googling shady domains to tie them to a malware family. Submit observables and get a pretty good guess on the nature of the threat. Inversely, focus on a threat and quickly list all TTPs, Observables, and associated malware. Let responders skip the “Google the artifact” stage of incident response. Let analysts focus on adding intelligence rather than worrying about machine-readable export formats. 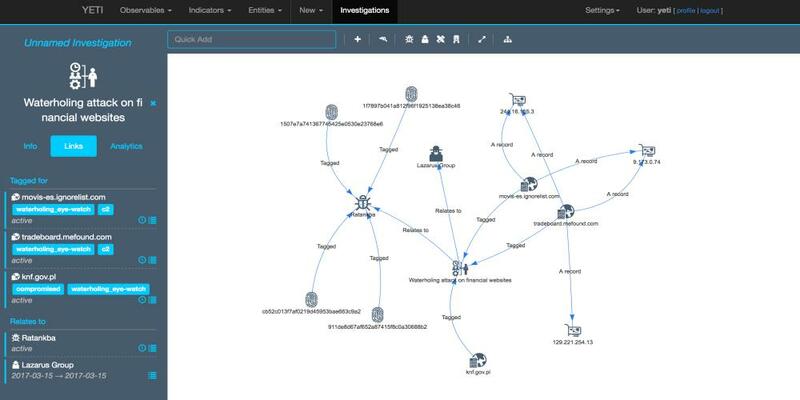 Visualize relationship graphs between different threats. Providing a web API to automate queries (think incident management platform) and enrichment (think malware sandbox). Export the data in user-defined formats so that they can be ingested by third-party applications (think blocklists, SIEM). Installing Yeti is pretty straightforward. This procedure was tested on Ubuntu 16.04, but YMMV.